Thank you for choosing Café Capri! 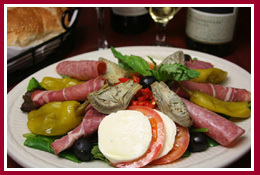 Since opening in 1979, we have come to be known as one of the finest Italian restaurants north of Boston. The same fresh, flavorful gourmet cooking you have enjoyed from our restaurant can also be enjoyed at any function you have planned. Our goal is to provide you with excellent food and service, as well as guarantee that any event you plan is a success. We at Café Capri are committed to providing you with the finest homemade foods, a beautiful presentation, as well as service surpassed by none. All menu items are priced per platter unless otherwise noted. Since all of our food is made to order, 24 hour notice is preferred. However, we will accommodate last minute orders to the best of our abilities. Cancellations are accepted until 24 hours prior to your event. Should additional items be needed after you receive your order, a minimum preparation time of 30 minutes is needed. You may place your order by calling 781-944- 9898. Please schedule delivery 30 minutes prior to event to ensure timeliness. There is no fee for any order picked up at our 355 Main Street location. Payments may be made by cash, check, VISA, Mastercard and American Express. House charge accounts are available to our regular clients. Rental Equipment (tables, chairs, coffee urns, etc.). We can provide you with contacts at local rental companies to provide these items. Mortadella • Imported Ham • Turkey Breast. Shrimp Scampi over Linguini ..